NEXT | Overwatch League season one playoffs start tonight! In a pretty stunning move, it’s just been announced that Overwatch League will be coming to your television on the ESPN, Disney, and ABC family of networks — starting tonight. Blizzard, ESPN, and Disney announced the broadcast deal earlier this morning. The deal includes not just the playoffs and Season 1 Grand Finals, but the Overwatch World Cup and Overwatch League Season 2 next year as well. ESPN is no stranger to esports, having broadcast several different competitions over the years — including Blizzard’s Heroes of the Dorm. But this is a pretty major deal, because we’re not just looking at a two or three day playoff or championship competition. It’s the first time all three networks have come together for a multi-year agreement. With Overwatch League looking at potential expansion and the addition of new teams, it’s a giant step forward for the League, and for esports in general. Fans of the current Twitch broadcast won’t need to worry though. The deal doesn’t cancel existing distribution agreements, including the one with Twitch. It just means that more people will be able to watch, and Blizzard may be able to bring in a bigger audience — people that might be interested in all the excitement Overwatch League has to offer, but simply haven’t had a chance to check it out just yet. The Overwatch League playoffs start tonight, and you can catch the action on Twitch as always, or on Disney XD and ESPN3. Day one of the Finals will be broadcast July 27 from the Barclays Center in New York on ESPN starting at 7pm. ESPN has the full broadcast schedule for the rest of the season available on its website. 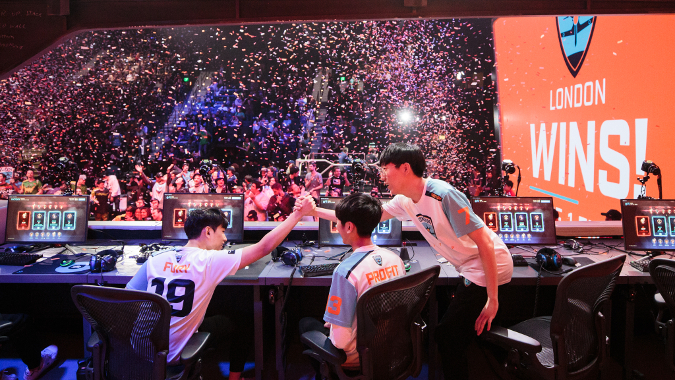 With the sheer popularity — not to mention the production value — of Overwatch League, it’s almost no surprise that major networks would want to get in on the fun. I know I’ve been looking (in vain) for a way to broadcast Twitch to my TV, now it turns out I don’t have to. Whether or not I’ll be able to tear my father away from more standard MLB offerings…well that’s a different challenge entirely. However, there’s no denying that Overwatch League is an exciting game to watch. We’ll have to wait and see whether Blizzard’s esports darling has the staying power to pull in significant ratings and stick around. But between Overwatch’s massive popularity, and the attention and care taken with every single broadcast, the League has the best shot of pulling it off. For more details on the deal and upcoming broadcasts, check out ESPN.